The root and rhizome of perennial herbaceous plant Glycyrrhiza uralensis Fisch. , G. inflata Bat.or L. glabra L.of family Leguminosae. Mainly produced in Inner Mongolia Autonomous Region, Xinjiang Uygur Autonomous Region and Gansu province in China. Plucked in spring and autumn. In autumn better. Fine tight cover, brown-red, firm, white-yellow cross section, rich powder. Sliced thickly, unprocessed or stir-baked with honey solution. Sweet, slightly cold; heart, lung and spleen meridians entered. Tonify qi of heart and spleen, dispel phlegm, relieve cough and dyspnea, relieve spasm and pain, clear heat and relieve toxicity, and harmonize property of medicine. It is indicated for intermittent or knotted pulse, palpitation due ro heart qi deficiency because it can tonify heart qi and reinstate pulse. For heart blood deficiency is a common complication of heart qi deficiency, it is applied singly, or combined with qi-tonifying and blood-nourishing herbs. For instance, it is used with Ren Shen, E Jiao and Sheng Di Huang in Zhi Gan Cao Tang from Shang Han Lun. It can tonify spleen qi, too. Owing to its mild action, it is often put into compound as assistant material to enhance action of other qi and spleen tonics. For instance, it is combined with Ren Shen and Bai Zhu in Si Jun Zi Tang from Tai Ping Hui Min He Ji Ju Fang. 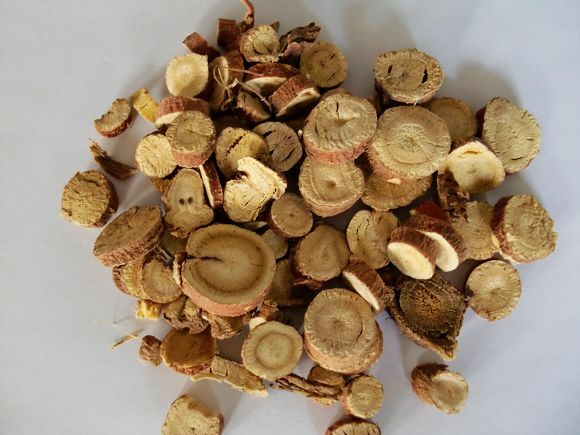 It is indicated for various syndromes of cough and dyspnea, including deficiency and excess, cold and heat types, and with or without sputum, because it can relieve cough, dispel phlegm and relieve dyspnea. For cough and dyspnea due to wind-cold attacking lung, it is combined with wind-cold-dispelling, lung-ventilating and dyspnea-relieving herbs. For instance, it is used with Ma Huang and Xing Ren in San Ao Tang from Tai Ping Hui Min He Ji Ju Fang. For cough and dyspnea due to wind-heat attacking lung, it is combined with wind-heat-dispelling, cough and dyspnea-relieving herbs. For instance, it is used with Sang Ye, Ju Hua and Xing Ren in Sang Ju Yin from Wen Bing Tiao Bian. For cough and dyspnea due to lung heat, it is combined with heat-clearing, cough and dyspnea-relieving herbs. For instance, it is used with Shi Gao, Ma Huang and Xing Ren in Ma Xin Shi Gan Tang from Shang Han Lun. For cough and dyspnea due to cold-damp, it is combined with lung-warming, damp-eliminating, cough and dyspnea-relieving herbs. For instance, it is used with Gan Jiang, Xi Xin and Ma Huang in Xiao Qing Long Tang from Shang Han Lun. For cough and dyspnea due to phlegm-heat, damp-phlegm, or dryness in lung caused by yin deficiency, it is combined with heat-clearing and phlegm-eliminating herbs, damp-drying and phlegm-eliminating herbs, or yin-nourishing and lung-moistening herbs respectively. It is skilled in relieving spasm to alleviate pain. For abdominal spasm pain due to spleen deficiency wirh liver excess, or spasm pain of limbs due to yin and blood deficiency, it is commonly combined with Bai shao, such as in Shao Yao Gan Cao Tang from Shang Han Lun. For abdominal spasm pain due to deficiency cold in middle energizer, it is combined with internal-warming and deficiency-tonifying herbs. For instance, it is used with Gui Zhi and Yi Tang in Xiao Jian Zhong Tang from Shang Han Lun. For abdominal pain due to dysentery of damp-heat type, it is combined with heat-clearing and damp-drying herbs, such as Huang Qin and Huang Lian. It is skilled in relieving toxicity and applied extensively. It is particularly indicated for various heat-toxin syndromes because of its heat-toxin clearing action and slight cold property. For sores and ulcers due to heat toxin, it can be used singly for internal or external use. But single using is limited in action, so it is commonly combined with heat-toxin-clearing herbs to enhance effect, such as Jin Yin Hua, Lian Qiao, and Huang Lian. For swelling and pain in throat due to heat toxin, it is applied singly for slight cases, such as Gan Cao Tang from Shang Han Lun; and combined with heat-toxin-clearing and sore-throat-relieving herbs for serious cases. For instance, it is used with Xuan Shen, Jie Geng and Niu Bang Zi in Gan Jie Tang from Zhang Shi Yi Tong. Besides, it has action of detoxification of intoxication by herbs or food. But it is used as auxiliary method of other modern rescue measures. It is combined in various formulas due to its good action of harmonizing property of medicine. 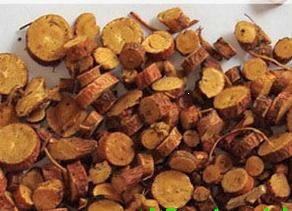 Through detoxification, it can reduce toxic property of some herbs, for instance, it is used with Fu Zi. Through harmonizing, it can alleviate violent dryness property of herbs to avoid impairing yin. For instance, it is used with Fu Zi and Gan Jiang; or alleviate cold property of herbs to protect stomach qi, for instance, it is used with Shi Gao and Zhi Mu; or alleviate purging action of herbs, for instance, it is used with Da Huang and Mang Xiao. It can make cold and heat herbs in a formula harmonized such as Huang Lian and Gan Jiang. It can modulate taste of herbs due to its rich sweet flavor. Decoct 3~10 g, raw material for heat-toxin relieving due to its slightly cold property; stir-baked with honey for tonifying qi, relieving cough, relieving spasm to alleviate pain. It is contraindicated for combining with Hai Zao, Da Ji, Gan Sui and Yuan Hua because of “eighteen antagonisms”. It is also contraindicated in cases of dampness obstruction in middle energizer and edema because it can help dampness obstruct qi, and it is prohibited from long-term usage in large dosage because it can induce retention of water and sodium and edema.